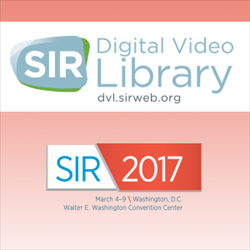 The SIR 2017 Digital Video Library includes feature-rich web presentations of the exceptional Annual Scientific Meeting educational sessions that took place March 4-9, 2017 in Washington, DC. This activity showcases the sessions presented at the most comprehensive world-wide gathering for all professionals devoted to the field of interventional radiology. It is SIR’s goal to promote the high-quality practice of interventional radiology through this and other educational programs. Activity participants receive information on basic and clinical research; techniques and technologies utilized by interventional radiologists around the world; and social, political and economic issues important to the IR community. Experience presenter slide animation, embedded video, and cursor movement as if you had been sitting in the meeting room. If you could not make it to Washington, take this opportunity to earn over 250 AMA PRA Category 1 Credits™. If you attended the SIR 2017 Annual Scientific Meeting, you can earn credits for the sessions in which you were unable to participate. NOTE: Credits are awarded at the session level and will not be awarded until all presentations within a session are viewed AND the session assessment and evaluation has been completed. If you have earned credit for this session at the meeting, you will not be awarded credit for viewing the archive. Demonstrate the high-quality practice of interventional radiology in a team environment. Review information regarding basic and clinical research in diseases, including techniques and technologies of interventional radiology. Discuss societal, political and economic issues of importance to the interventional radiology community. This program is designed to meet the educational needs of interventional radiologists, oncologists, diagnostic radiologists and other physicians with special interest in IR; nurses at all levels; radiology technologists at all levels; and physician assistants. The SIR 2017 Digital Video Library activity allows individuals to watch the previously recorded SIR 2017 Annual Scientific Meeting sessions at any time. You may view the presentation and listen to the audio feed; no manual slide advancement is required. A link to download the slide handouts is also provided to the participant. Participants may view the presentation at their convenience and may also receive CME and SA-CME credits for completing the activity until the activity expiration date.